Libraries have long been valued as places where people come seeking knowledge, be it in the form of books, journals, maps, documents, or more recently, through films, videos, and other types of electronic and digital media. Visual art is another form of information and, one could argue, another kind of knowledge. Artists are among those who see libraries as indispensable sources of both information and inspiration. 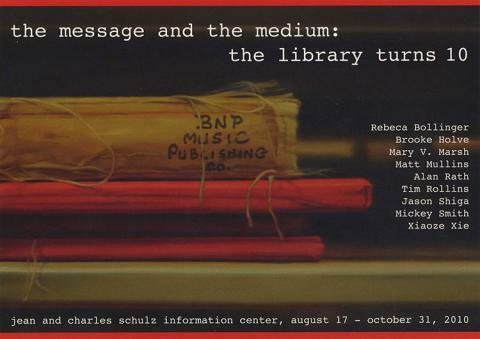 On the occasion of the University Library's 10th anniversary, the University Library Art Gallery presents the exibition the medium and the message: the library turns 10, which is intended as a contempation on the transmission of information in its myriad forms as seen through the eyes of the nine participating artists, Rebeca Bollinger, Brooke Holve, Mary V. Marsh, Matt Mullins, Alan Rath, Tim Rollings, Jason Shiga, Mickey Smith, and Xiaoze Xie.